Renowned slot developer IGT have long been heralded for releasing some of the most fantastic slots on the market. You don’t need to look far to see examples of this craftwork in the form of the innovative Da Vinci Diamonds Dual Play slot and the legendary Cleopatra slot. 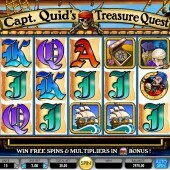 IGT know how to make a great slot and this Captain Quid’s Treasure Quest is another solid IGT slot release. This 5 reel, 15 payline slot has a pirate theme. Let’s not lie, everybody loves a good pirate theme. Whether it is a group of girls on a hen night or lads dressed up as pirates pretending to be Captain Jack Sparrow from Pirates of the Caribbean, it is a theme you cannot get wrong! In fact, when I was asked to take on this review I thought it was a dream combination mixing IGT with pirates! The symbols on the reels are all very “piratey” (yes, I just invented that word!) including Captain Quid himself, a pirate ship, pirates, a compass and the standard 9 through to Ace symbols. The Wild symbol is represented by the Captain Quid’s Treasure Quest logo. This substitutes for all other symbols, except for the treasure chest bonus Scatter symbols, to complete winning combinations. As mentioned, the treasure chest bonus symbols act as the Scatters and you must hit three or more of these across the reels to trigger the Treasure Chest Bonus. You will be taken to a second screen where you must dig for free spins and multipliers. It is possible to gather up to 40 free spins and up to a 10x multiplier on this bonus feature. 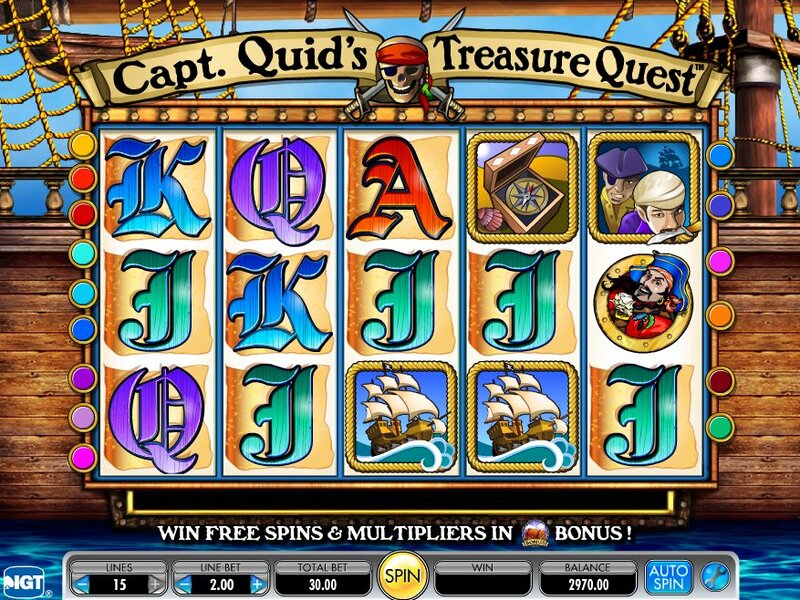 Captain Quid’s Treasure Quest is slots gaming stripped right back to its core. You have a simple set up of Wild, Scatters and a bonus feature that gives you the chance to win free spins and multipliers. There are a lot of pirate-themed slots out there such as NetEnt’s Ghost Pirates slot but this is the one slot that has kept my attention for the longest. I just loved its simplicity and the fact that the bonus feature is the key to winning free spins rather than having a separate bonus feature and free spins bonus round. I said it at the start of this review, this is another solid IGT slot release.